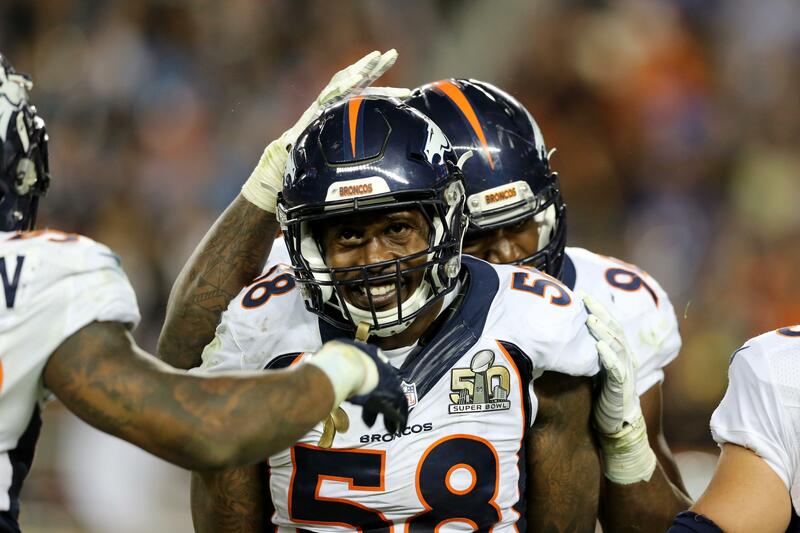 Wed., April 19, 2017, 12:40 p.m.
ENGLEWOOD, Colo. – Von Miller has his Super Bowl 50 helmet back. The FBI retrieved his helmet from Mexican authorities who also recovered Tom Brady’s two Super Bowl jerseys in Mexico City last month. Special agents Brian Schmitt, Melissa Tallman and Clint Judd delivered the helmet to Miller at the UC Heath Center on Wednesday. Miller said last week he didn’t even realize his helmet was missing after leading the Broncos to a 24-10 win over Carolina in Super Bowl 50. Miller was voted the game’s MVP after his two strip-sacks of Cam Newton. Miller had placed several decals of U.S. military branches on the inside of his helmet in honor of service members during the 2015 season. The league allows players to place one decal from a branch of the military on the back of their helmet during its annual “Salute to Service” week. Miller placed one on the exterior as allowed and stuck the rest on the interior, and that helped authorities authenticate the helmet. After leading New England to a fifth Super Bowl in February, Brady said somebody stole the jersey he wore in the Patriots’ comeback win over the Atlanta Falcons. He revealed the next day that the jersey he wore in New England’s 2015 Super Bowl win over the Seattle Seahawks went missing after that game, as well. The jerseys were found along with Miller’s helmet after authorities obtained a warrant to search property of Martin Mauricio Ortega, a tabloid journalist who colleagues say went to the game with a media credential, but bragged he was there as a fan. Brian Drent, president and CEO of Mile High Card Company, an auctioneer of fine sports memorabilia in Colorado, said Ortega told him last year that he had Miller’s Super Bowl 50 helmet and asked how much he might get for it. Published: April 19, 2017, 12:40 p.m.